So we are still waiting on some spoilers to roll in, and I’m sure that there will be a few more winners and losers worth discussing once we have the full 249 revealed. I’m confident that we have enough so far that I can make a full length article out of it, and that makes me very very very very very very very very very very very very very very very very very very very very very *checks word count* very very very very very very… very happy. WINNER: MERFOLK! Merfolk was actually the first big winner with this set, because the first two cards spoiled (Force of Will and Wasteland) are THE financial gatekeepers to playing this deck in Legacy. Merfolk is not the best deck in Legacy, but only because there isn’t a best deck in Legacy. Merfolk is a strong, linear archetype that doesn’t require Alpha duals, is able to win large tournaments, and largely comprised of Modern cards. The difference between ‘optimized’ and ‘budget’ lists has always been the inclusion of Wasteland and Force of Will (moreso the latter than the former due to the need for UU consistently), but any permutation seems to have its advocates. Merfolk was one of the more popular decks at the beginning of the Legacy boom a few years back, and it has only gotten better tools since (Master of the Pearl Trident is much better than Coralhelm Commander). Daze is another big piece for the deck, although Wasteland, Mutavault AND Cavern of Souls probably encourage shaving copies down. Fish just won a Modern GP, so its possible that there are people scrambling to build this for that lesser format, but know that this is a known player in Legacy, and probably one of the strongest decks that is not difficult to cobble together. I expect representation to be high for the next year or so, or however long it takes for EMA to totally dry up. 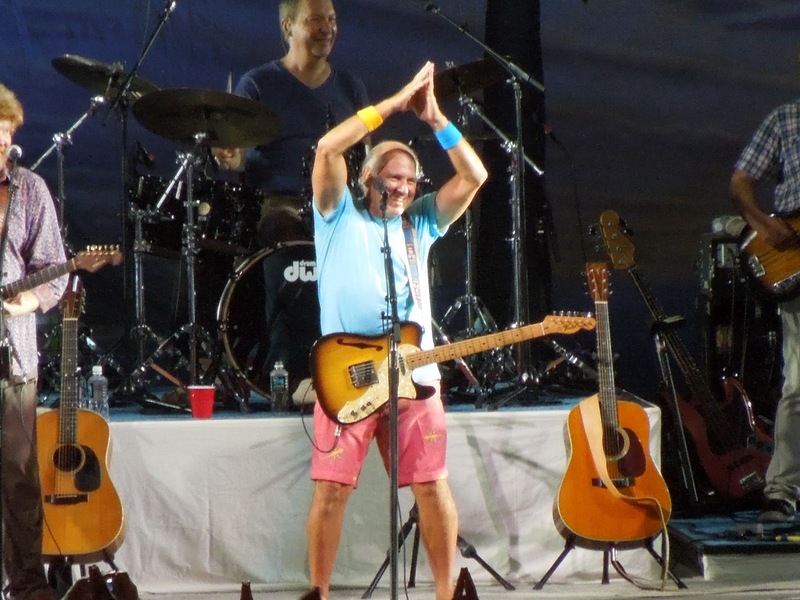 Legacy events will be like Jimmy Buffett concerts- fins to the left, fins to the right. LOSERS: THE PEOPLE GETTING HYMNED IN EMA LIMITED! Oof, good luck. There’s a reason why people still stand by the old adage of “Hymn, Hymn, I win”. And now it looks like they have Sinkhole to back it up! EMA block constructed looks like one of the most fun formats, maybe that should be the new Legacy? I’m in if y’all are. WINNER: DREDGE! So Dredge itself is not an archetype in EMA, but Ichorid, Cabal Therapy, and some lesser/formerly played pieces (Chrome Mox, Entomb) are all getting reprinted. 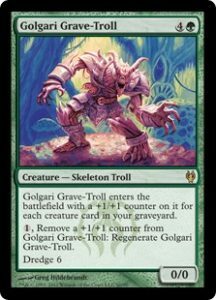 Expect Golgari Grave-Troll to continue disappearing off shelves (as we discussed here previously!) and keep your eyes peeled for that Izzet v Golgari box. LOSERS: EVERYONE BUT DREDGE! Look, I am the biggest supporter of Life From the Loam that there is, but I’m not going to call myself a fan of the Dredge deck. I don’t think we will ever see this archetype hit quite the same saturation numbers as Merfolk (because it is harder to play and easier to hate), but I do worry that on those weekends where it’s Dredge’s tournament to lose that we will see more than the one player that ran hot to get to Top 8. If there is ever a Legacy Top 8 with three or more Dredge lists, the world will become a foul and miserable place. WINNERS: POPULAR CARDS WITH LOW SUPPLY: A lot of the cards that we are getting reprinted come from Magic’s very distant past, and are therefore bound by the scarcity issues that come with wanting something that hasn’t been made in nearly twenty years. This also includes more recent, but otherwise limited release cards such as Shardless Agent. Having new life entering the market is going to allow people more opportunity to snag what they want, while simultaneously buoying price on high demand in the short term. It is still possible that many of these cards increase in price when all is said and done, which I think we now all know as the “Tarmogoyf Principle”. The interesting thing is going to see how it plays out across rarity and format (Legacy vs Vintage). Sinkhole is a popular card in the Mono Black decks that lots of new Legacy players gravitate towards. Even though the card was originally a COMMON, it has since been (perhaps rightly) upgraded to rare. The more Sinkholes there are, the more people will sleeve up Dark Rituals, Hymns, and whatever the 2016 version of Phyrexian Negator is. Water finds its level. Prices on cards you and everybody else like will be in outer space in two years. Buy now! LOSERS: NARROW CARDS WITH LOW SUPPLY! Mana Crypt at Mythic means that we won’t see so many that supply skyrockets, but this is a card only played as a 1x in Vintage (and possibly in Commander? Is it banned there also? )- how much demand is there? Mana Crypt and an Island is still a turn 1 Tinker, which is a good opening turn in Vintage, but how many people will willingly start to play without Power? Water finds its level, and I think that cards like Crypt that have been high because there are so few of them will drop when supply tiptoes past demand. 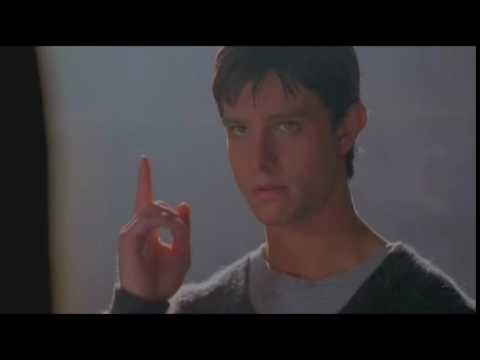 Say we (the royal ‘we’) get 10,000 new Mana Crypts (a number that I totally made up)- are 10,000 people one Mana Crypt away from playing Vintage? Maybe a few are, but the rest of those are going to get sloshed around vendor tables for a while. WINNERS: ART LOVERS! This may be the most aesthetically pleasing set in Magic’s history. 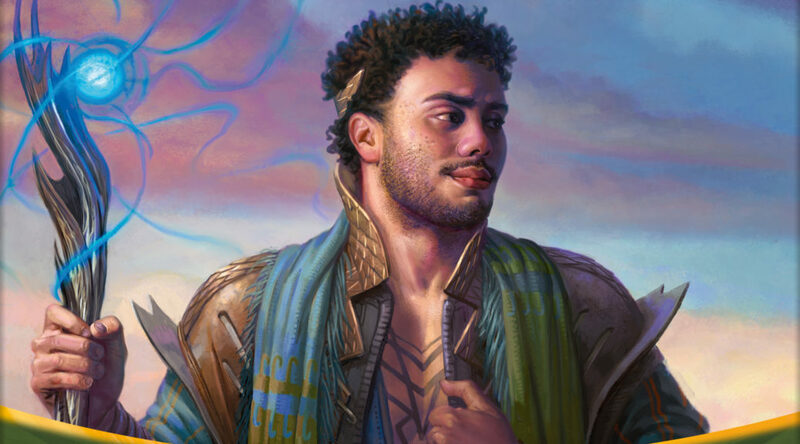 WotC commissioned a very high percentage of new pieces for this set (partially, I assume, because they had lost the rights to many older artworks1), and they are all stunning. 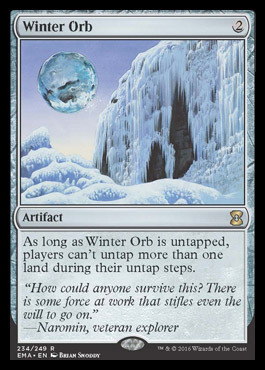 The new Winter Orb is probably my personal favorite, just because it captures the eerieness that the card has always had, while simultaneously looking like an album cover for some sort of sweet symphonic metal band. “WINTER ORB”, the new album by MYTHRIL PROPHECY. LOSERS: ANYONE WHO OPENS A BRAGO! I can handle a lot, and I didn’t mind that a lot of cards got rarity upshifts due to Limited, but seeing THIS card in THIS set really irked me. Blue White blink could be the best draft deck in the format, and I’m still going to be miserable taking this card. It’s a good thing he’s already dead, because I’d kill him myself. WINNER: ANYONE WHO DRAFTS BLACK! Windmill slam that Braids, even if the foil is good. This color is insanely deep at the middle rarities, and has some pretty strong commons also. LOSER: ME, FOR CALLING BERSERK! Wow, this was a real shocker. I thought Berserk was as good as in, and it looks like its not. This just makes the call for Fish decks look even better, as trying to respect an optimal Infect list requires some resource commitment, and now they don’t have to do as much. Buy your Lords of Atlantis! WINNERS: PAUPER PLAYERS! Now, Pauper players are already awesome, super-smart, and overall great people, but they got some major rewards with EMA. There are going to be some commons in this set with extremely high foil multipliers (I’m looking at you, Man-O-War! ), even though they aren’t “traditional” staples. Let’s close out today with a list of foil targets, prioritizing high multipliers and low visibility. Nimble Mongoose: Sweet art, foils are currently insane- this is going to be respectably expensive. Emperor Crocodile: Once a rare, now a common. This is more of a foil spec, but definitely a long-shot. Maybe one of the green stompy decks wants this? Duplicant: Okay, not a common, but Duplicant has only had (compared to today’s standard) low printings, so foils always garner a high margin. This art is not the worst that the card has had, and the original is not necessarily iconic. I don’t this printing will cause foils or non-foils to bottom out, but they will briefly be cheaper. Mistral Charger/Elite Vanguard: There are a lot of people excited about these? I don’t know how good either one is, but I wanted to pass the word along. Rally the Peasants: This was an uncommon before, right? Makes the WR decks a lot better if it was. Swords to Plowshares: Not too many opportunities to get this card in foil, so always take the chance when you can. Peregrine Drake: Cloud of Faeries was banned in Pauper, and I think this was only ever an uncommon, so maybe it makes that deck better? Tough call, because the curve was much lower originally. Man-O’-War: Still played in a large percentage of cubes, never previously available in foil. Make up a price, and someone will probably pay it. Innocent Blood: Second time this card has been available in foil, and it’s a VERY popular card. Night’s Whisper: First time that this art has been available in foil, and it’s also the first time the card has been printed at common. Prowling Pangolin: Originally an uncommon, this could sneak its way into some of the black pauper decks. Baleful Strix: Has this card ever been available in foil? I don’t think it has. Beetleback Chief: I know this card was never available in foil, because I would own 100 of them. Crater Hellion: Never before available in foil. That’s it for now, have fun poring through EMA, and I’ll see you next week! 1This sounds like a job for VorthosMike! “Roger Dean” was a popular progressive rock band album artist. Google image him; very Winter Orb-y. This was an excellent recommendation. One reason wizards commissions new art is to match the style and quality of today’s artists, but the less nice reason is that they don’t want to pay the old artists royalties on new card sales. That’s why they commissioned new art for a bunch of staples during 5th edition, and ever since then they don’t pay artists royalties on card sales, only a one time fee. That also don’t pay artists of they use their image on booster boxes, playmats or other branding materials. They’re an old fashioned company when it comes to spreading around the wealth. .
Man-o’-War had a promo with the old frame and original art years ago. Also, Brainstorm. Lol, yes! Love for symphonic metal! Sorry, this has been an exceptionally hectic week, and I was trying to keep the spoiler reviews going while also finishing this piece. I’ll make sure that future pieces are held to tighter strictures. And FWIW, I don’t like one week spoiler seasons anymore- it’s insanity.